Message for Steve Shirley and Maintenance Team. My name is Malcolm Scott and I am a trustee at the North East Land Sea and Air Museum up here in North East, at the site of the old RAF Usworth Station. Now the Nissan Car Plant. We rescued a Salamander in 2018 from a lock up garage in Newcastle. It is the C variant with the large monitor. It had no engine and a lot of the light wheel arch bodywork has corroded away. We want to restore it as a static display exhibit as it does not have an engine. I have been in contact with Steve Robertson in the North East who has suggested I contact you to see if you can help us with some info. I hope to start cosmetic restoration in March and would like to know what colour spec red is appropriate for the RAF Salamanders as I need to purchase the correct paint. Can you help. I look forward to your reply if you are able to give us any advice regarding the paint specification. Steve has advised me that you have now moved to Scunthorpe after quite a traumatic few months. I hope the council there give you a better deal than your last landlords. Once you have sorted yourselves out, is it possible that you could help us out regarding a couple of items we need to sort the vehicle out. 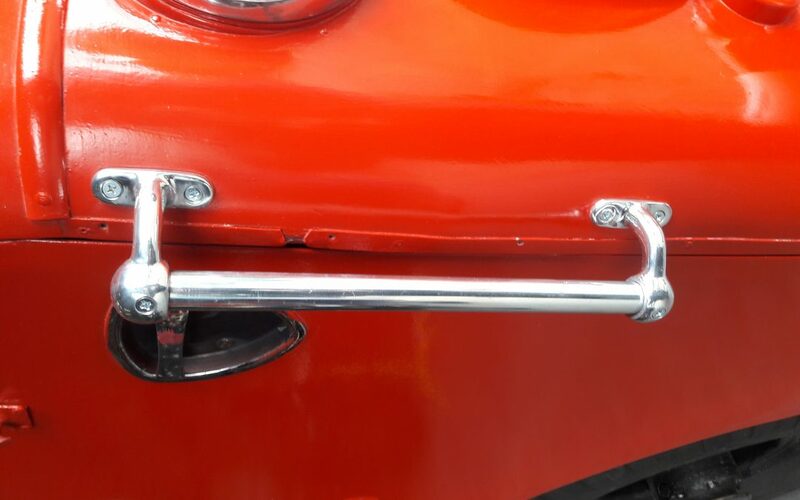 We are looking for the front grab handle sets and also the indicator units.